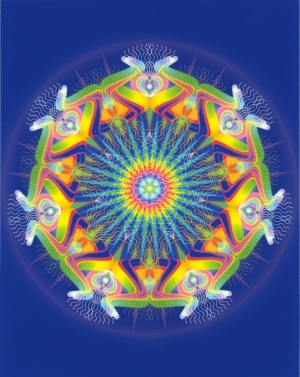 "In the eighteen years since the inception of Lahrinda's first mandala creations, she has evolved the original concept based on astrology to include sacred geometry, number power, color radiance and the blend of all by a spirit-consciousness. They are now called Symbalas and have an empowering effect on one's energy consciousness. Whether they are named, or created specifically for a person, the resonance has the ability to change and transform. Thank you, Lahrinda, for your continued persistence in developing a tool as beautiful as a snowflake and as limitless as the sacred forms."